Has the formation of any lunar craters been witnessed by humans? There are a few definite yes answers (for lunar flashes during meteor storms), a likely no answer (the putative 1953 flash), and a definite maybe. The maybe is the tale by five English monks who were sitting outside an alehouse in 1178 AD and saw "fire, hot coals, and sparks" on the edge of the 1.5 day old crescent Moon, which "writhed and throbbed like a wounded snake." In the 1970s, lunar scientist Jack Hartung proposed that the monks had actually witnessed the formation of the 22 km wide crater Giordano Bruno, just on the farside around the limb from Gauss. 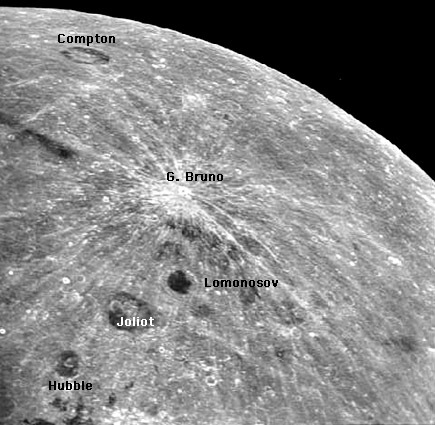 Hartung proposed this because Bruno is in the right location and its the youngest large bright crater on the Moon. Almost all professional scientists disagreed with this suggestion, which I of course was attracted to. Three years ago, Paul Withers, a young graduate student at the University of Arizona, said that if a 22 km wide crater had formed that night, the Earth should have been bombarded with a magnificent meteor storm the next week as ejecta was swept up by our planet. And there is no record that anyone saw such a fantastic shower. So the conventional wisdom is that the monks (and Hartung) were misled by a bright meteor that happened to come at them in the Earth's atmosphere from where the Moon was in space 375,000 km further away. But, scientists bouncing a laser off a reflector left on the Moon by astronauts discovered that the Moon is ringing like a giant gong. 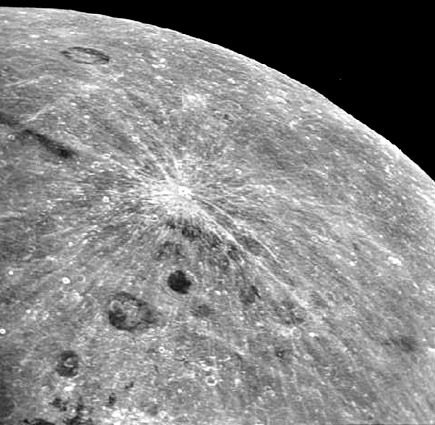 They proposed that an asteroid impact on the Moon 1000 years ago could have set it off. Coincidence? Although the monks saw "fire" on the Moon, this LPOD title refers to Giordano Bruno's demise - burned at the stake for promoting unpopular ideas. Hartung got off easy! Another handheld photo by the freezing Apollo 13 astronauts who rounded the Moon on an arc back to Earth. Full Moon view shows dark mare deposits on floors of some craters and bright rays radiating from G. Bruno. This page was last modified on 16 April 2015, at 01:04.